PHUKET: Pura Organic Foods Ltd opened its fresh farm organic shop about a year ago, and in addition to the ever growing number of restaurants and resorts, more good food minded consumers are finding their way to their store (on the main road 402 just north of Thalang). Globally, consumers are becoming more and more critical of what they eat and the fact of the matter is that organic tastes better, is more nutritious and is simply a healthier choice. Excessive use of chemical fertilisers, herbicides and pesticides depletes soil of many elements, which causes vegetables and fruit to become potentially risky, less nutritious and far less tasty. Associated with the organic farm and 5 star resort of Thanyamundra in Khao Sok and Surat Thani, Pura Organic Foods Ltd today has access to more than 1,000 organic products and a network of over 70 organic suppliers from all over Thailand. A few months ago Pura Organic started a home delivery service whereby customers can order by email, telephone or via their online shop (www.puraorganic.org), which is delivered to their doorstep. 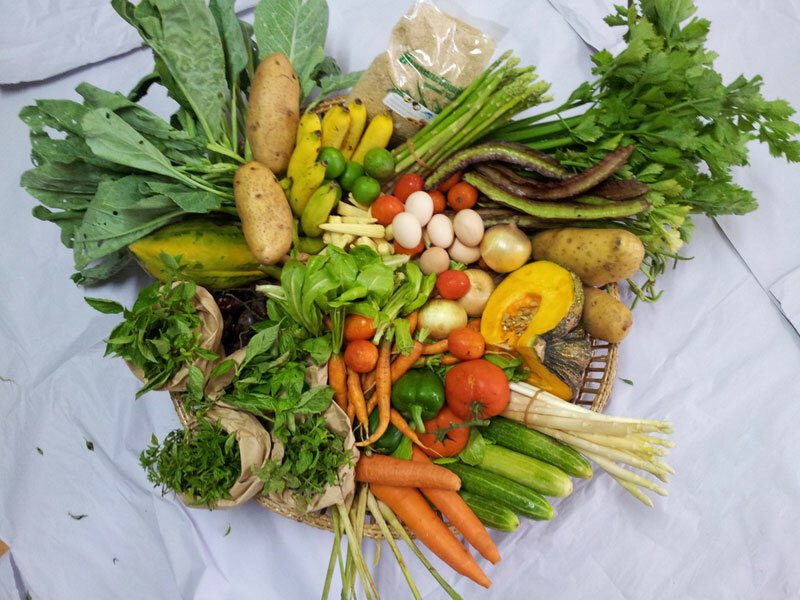 Starting in 2013, Pura has also launched a weekly “Deliciously Healthy” Home delivered box service, these boxes are filled with farm fresh organic seasonal produce and are available in two sizes, for B1,250 and B1,050 per box, respectively. This way the consumer doesn’t have to make a choice and simply receives seasonal farm fresh produce. The box contains vegetables, fruits and herbs but additional products (such as organic milk, eggs and chicken) can be added if so desired. With juicing becoming more and more popular all over the world, Pura will also soon be introducing a special version box which contains ‘juice-able’ fresh items and which can optionally be combined with various ‘super food’ items like raw cacao, spirulina, and wheatgrass powder. Pura thinks juicing should be as organic as possible, because it means consuming large quantities of vegetables and fruits (a lot more than in a normal diet). Not opting for organic produce increases the consumption of unhealthy chemicals we ought to avoid. Recently, Pura became the agent for world’s best home juicing machine, the Hurom, which is available at Pura for B12,900. Juicing is different from blending. The latter is seen as ‘outsourcing’ chewing, and the body reacts the same as normally to it. However juicing, especially ‘slow juicing’ as with the Hurom, which rotates 80 times a minute, extracts fibre from the material and what remains is absorbed by the body in a more direct way. Great variations are possible, for instance with kale, sweet potato, carrots, beets, tomatoes, kwantung, beans and of course many fruits. Compared to a high speed blender, slow juicing doesn’t create friction and therefore doesn’t reduce nutrition. In addition, the slower speed creates less air in the drink, which allows for better keeping. From next week, Pura will also sell their new line of health drinks “Swash 100% juice”, a Phuket-made product by the same people who make their popular “Swash Organic 5 Bacteria Yoghurts” and a range of healthy snacks. These juices will be available in seven different flavours. Last but not least are Pura’s selection of ‘super foods’, an unscientific term to describe food with high nutrient and health benefits. These include Raw Cacao, Chlorella, Spirulina, and Chia Seeds. Of course, we at Pura Organic consider all of our fresh organic produce to be ‘super’ food.